A grand canyon, a historic fort, and a mammoth structure like no other… these treasures and more can be found along the North Loop of the Grand Loop Road (map found here). 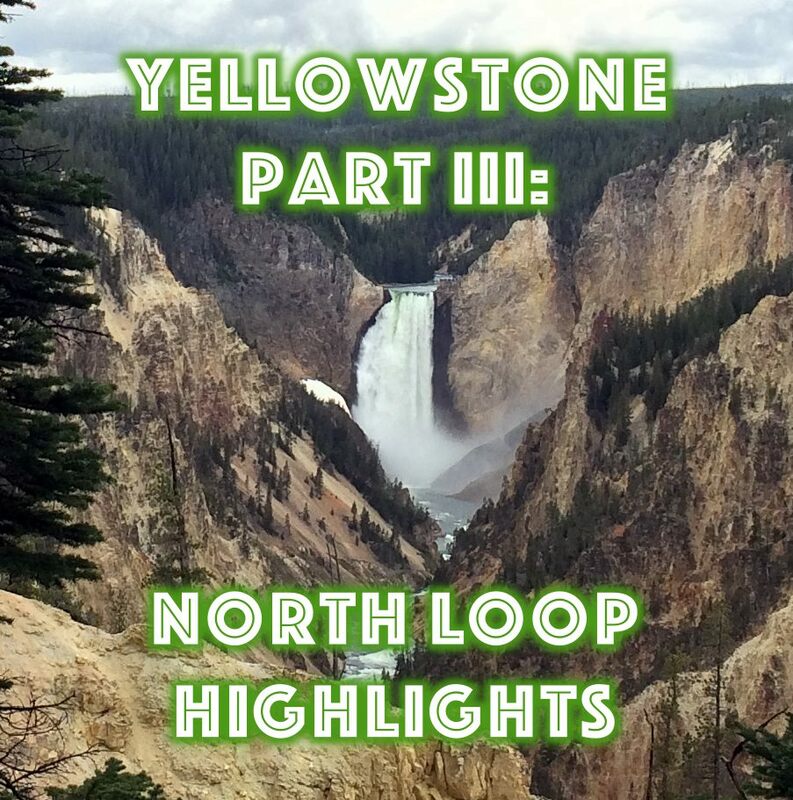 After spending some busy days crossing the center of the park and exploring the South Loop, we dedicated the next portion of our Yellowstone adventures to touring the North Loop. 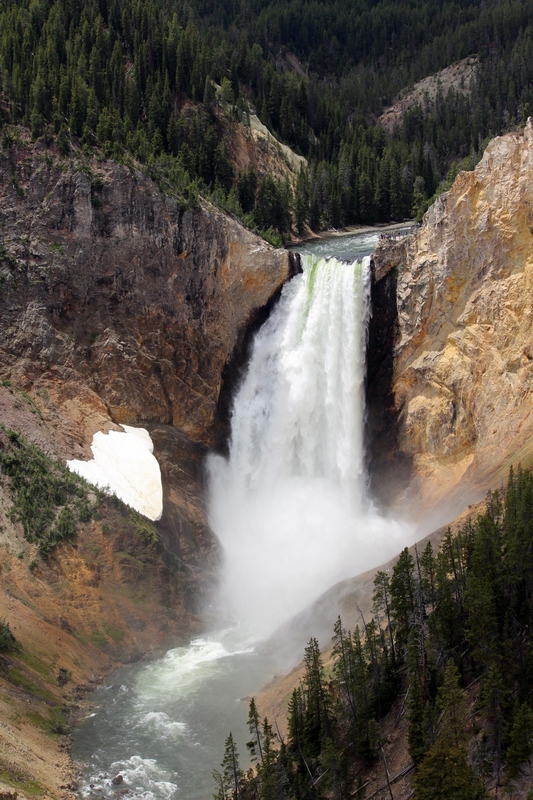 The Grand Canyon of the Yellowstone is a site so spectacular it would be worthy of a visit even without the other attractions in the park. Visitors will find two huge waterfalls in this area, known as the Upper Falls and the Lower Falls. 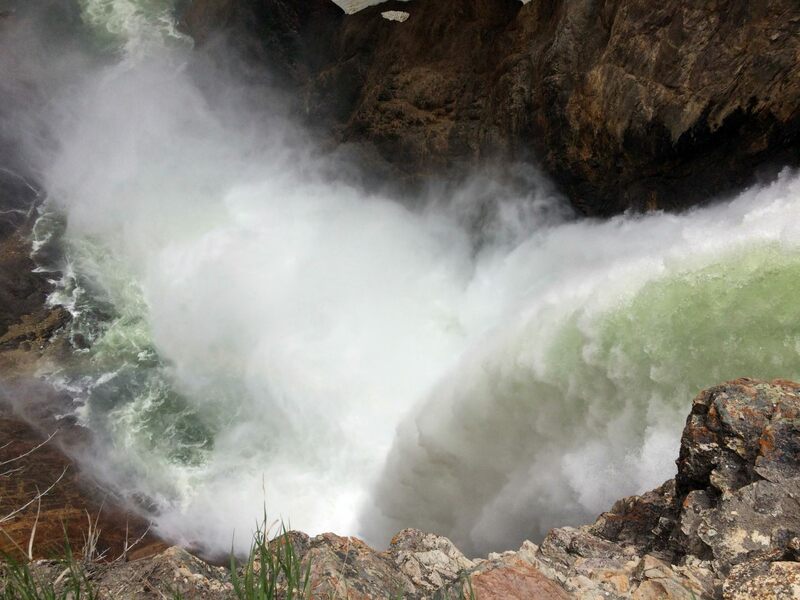 We opted to get up close and personal with the Lower Falls by hiking to the brink. 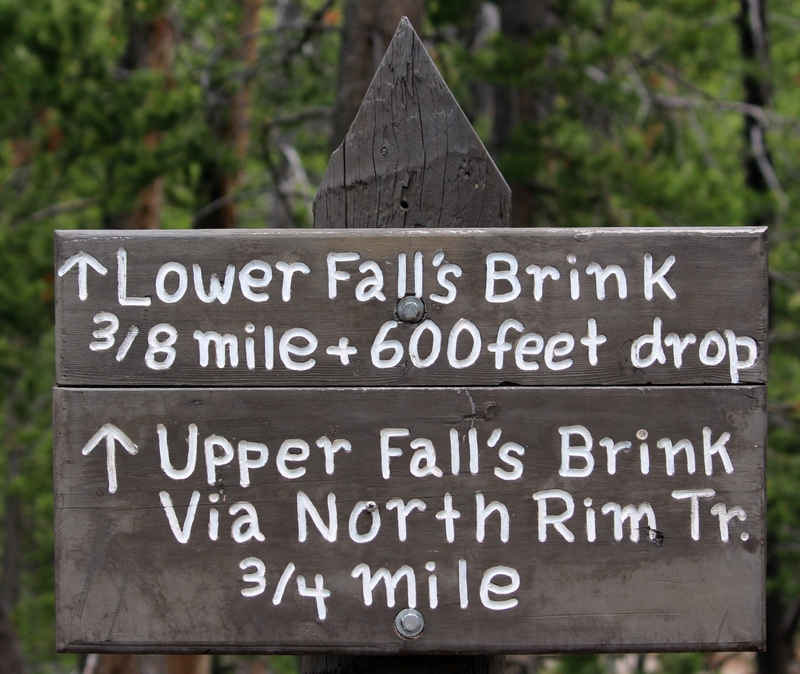 The Brink of the Lower Falls Trail is quite short, at just three-fourths of a mile down and up, but it’ll make you huff and puff with 600 feet of elevation change (be prepared for that hike up–it’s a breathtaking, literally!). 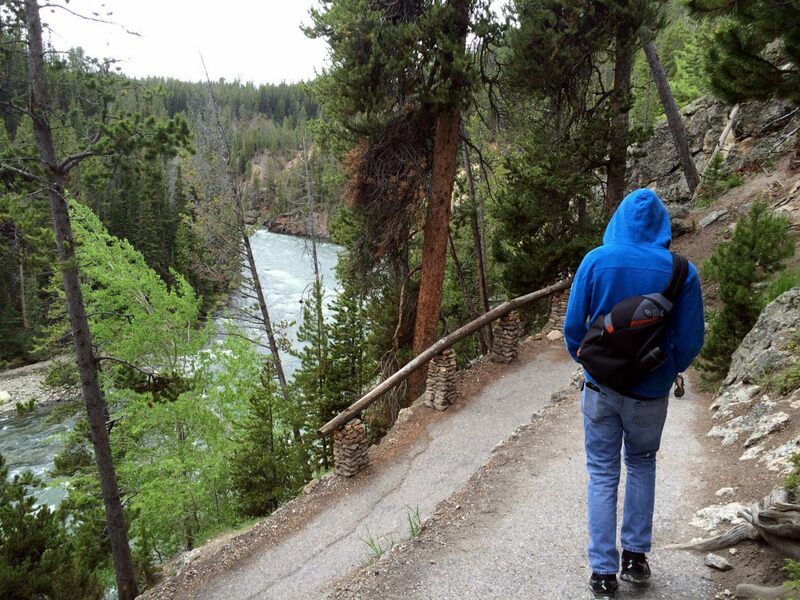 As we made our way down the switchbacks, we had lovely views of the cascading blue waters of the Yellowstone River slicing its way through the green woodlands. The trail ends at a large platform overlooking the exact spot where the roaring river suddenly plunges 300 feet into the canyon below. This is about twice the height of Niagara Falls. The water makes a swirling mist as it disappears into the valley below. It’s a dizzying experience looking down as the roar of the falls fills your ears. 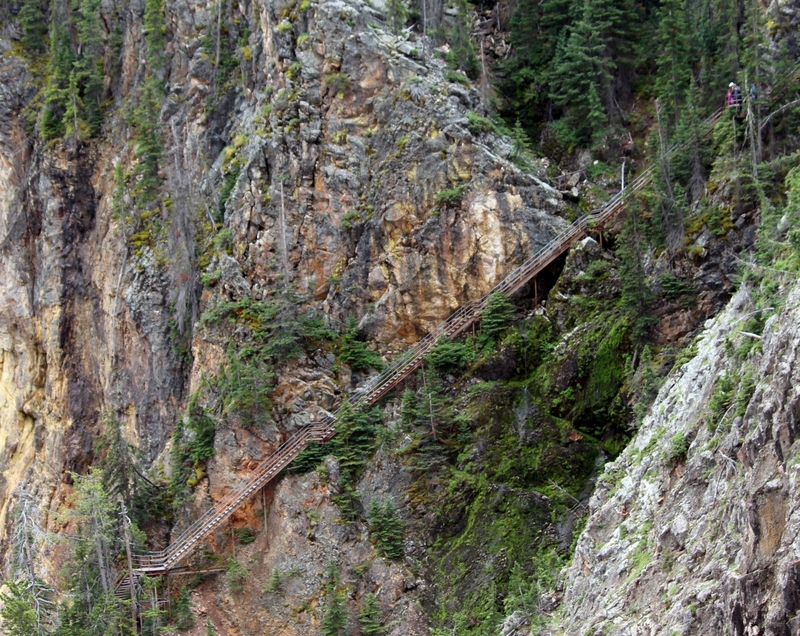 From this platform, you can also check out the staircase that takes hikers of Uncle Tom’s Trail right into the canyon. We didn’t do this hike, but can you imagine?!? Look closely to see the staircase in this photo—would you go here? After experiencing the falls from above, we decided to get another look at them from afar. Visitors can do this at viewpoints with wonderful names like Inspiration Point, Grand View, and Artist Point. These areas inspired some of the famous paintings by Thomas Moran–the ones that convinced politicians back East to create the park. It’s crazy to look at Lower Falls and to think we were just standing at the top of it. The big patch of white to the left of the falls is actually snow. 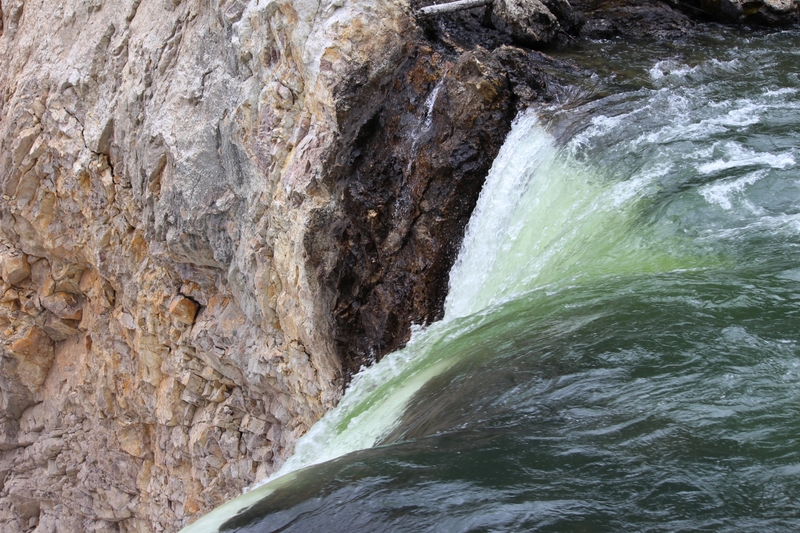 From above, you can see the whole canyon unfolding below the Lower Falls. The walls have been painted by different minerals and chemicals in the rocks. This deep canyon extends for twenty miles along the river. We also enjoyed the site of ospreys nesting on the pillars of rock. 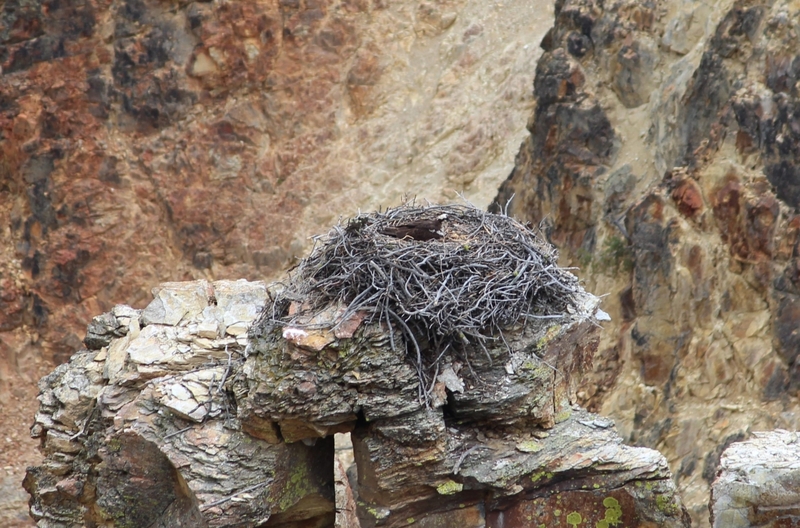 They have huge nests that seem precariously placed high above the canyon below. 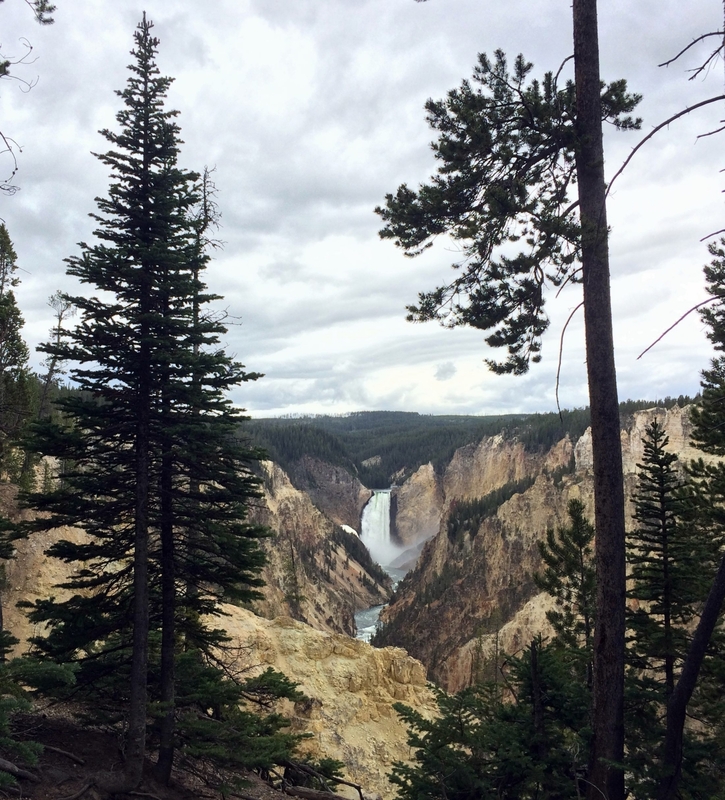 If you’re planning a trip to Yellowstone, be sure to allot plenty of time for the Canyon Village area. 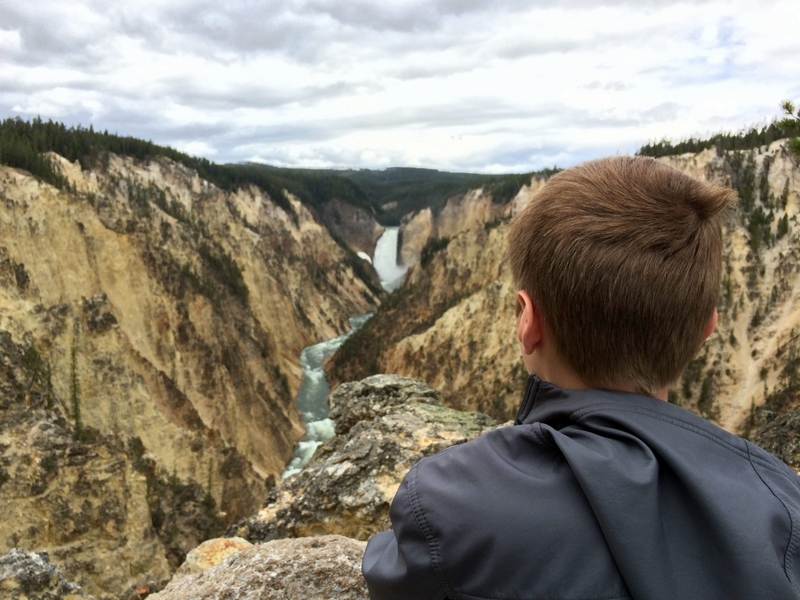 The Grand Canyon of the Yellowstone doesn’t disappoint! 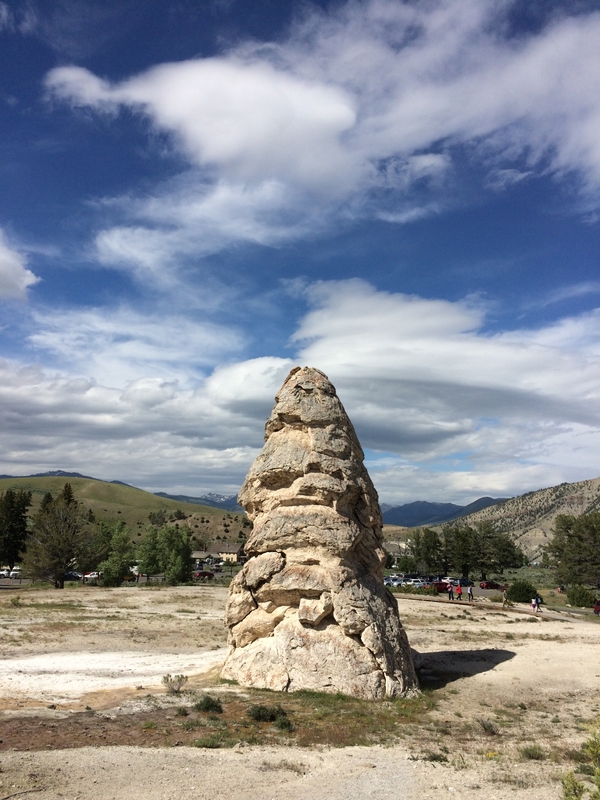 The drive from the Canyon Village area to the Tower-Roosevelt area and onto Mammoth Hot Springs offers beautiful views, as well as the opportunity to spot more wildlife. Yet again, we felt like we were in a whole different place. Yellowstone has a way of doing that to you. The Grand Loop Road seems to rise in elevation as you make your way northeast. The snow lining the roadway tipped us off to our elevation. This part of the journey offers spectacular views. 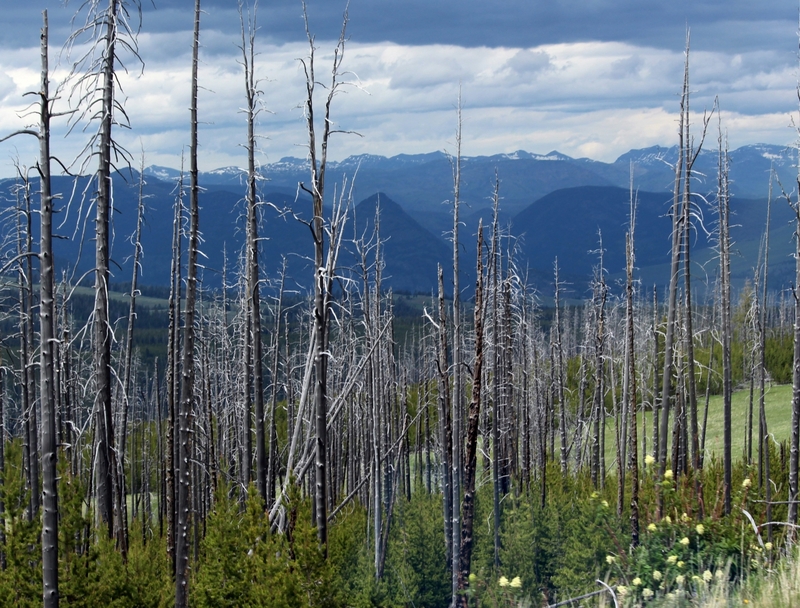 Even the dead trees painted a pretty picture as their silver bark glimmered against the dark mountain peaks. For the best views, adventurous hikers can do a 5-mile hike up Mount Washburn, the highest peak in the park at over 10,000 feet (again, I couldn’t convince my guys to do this–maybe someday!). 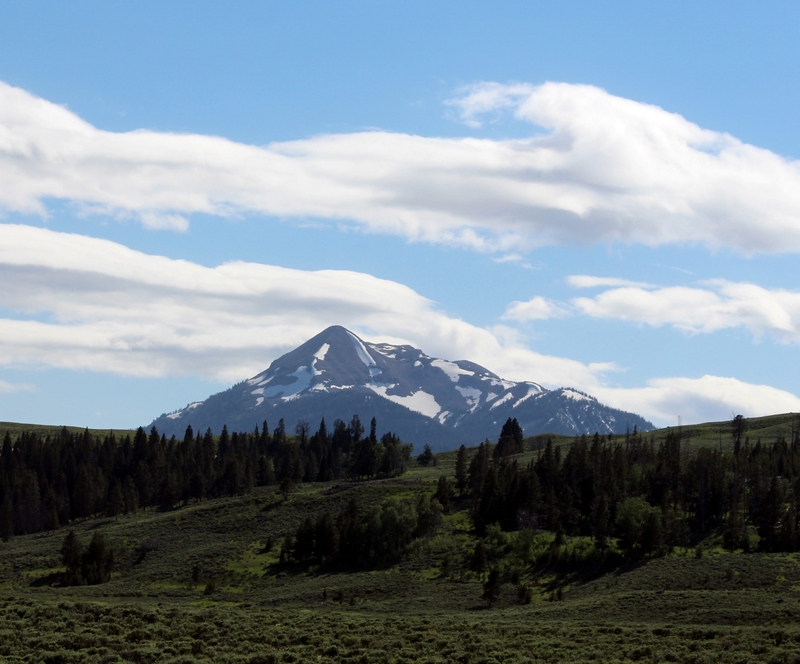 I think this picture shows Mount Washburn, but I could be wrong. In either case, look, a pretty mountain! We spent a lot of time gawking out the windows. 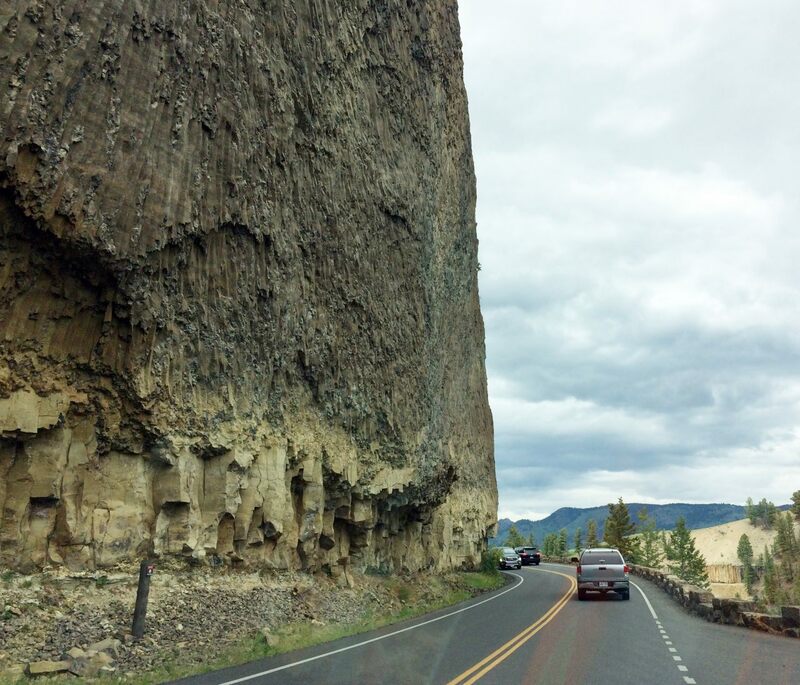 At one point, this bluff towered over the roadway. As we approached the Tower-Roosevelt area, traffic suddenly came to a standstill. We assumed we had encountered another buffalo traffic jam, but soon, we realized it was something else: a bear! 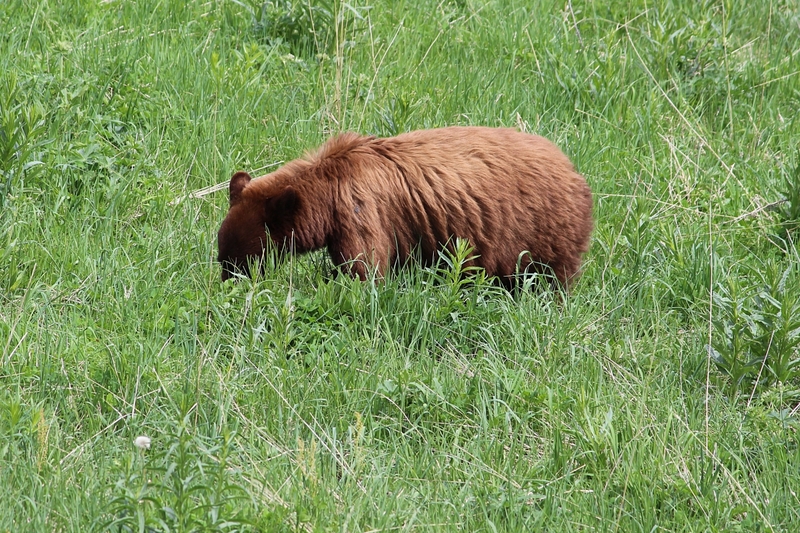 This was our only bear sighting in Yellowstone. Thanks to a telephoto lens, it looks like we were really close, but I assure you, we were quite far back and remained in our car. Our family was excited to share this experience. I wanted to yell, “Hey, bear!” to get it to look up, but I restrained myself. We didn’t do anything in the Tower-Roosevelt area. Somehow, we missed the Tower Fall, which we passed right by. It looks interesting in retrospect. 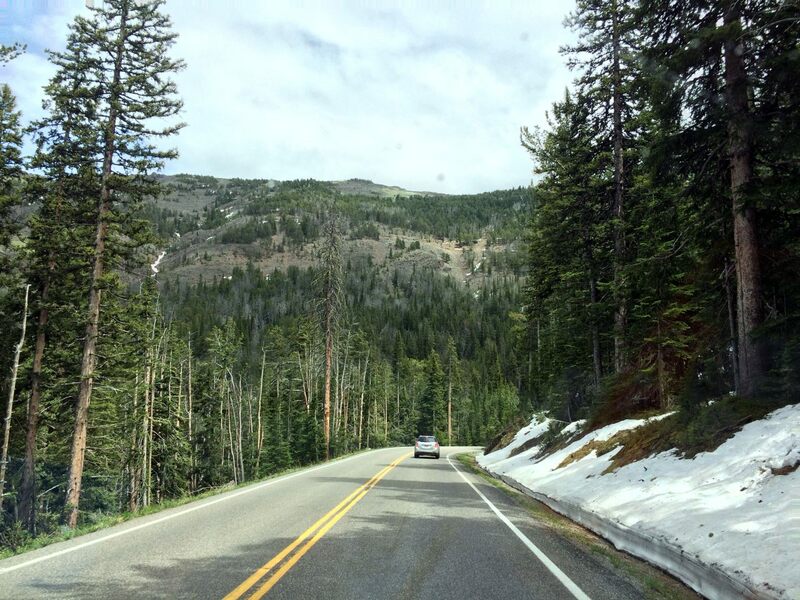 Even though we didn’t make many stops on this part of the journey, we really enjoyed the beautiful drive. 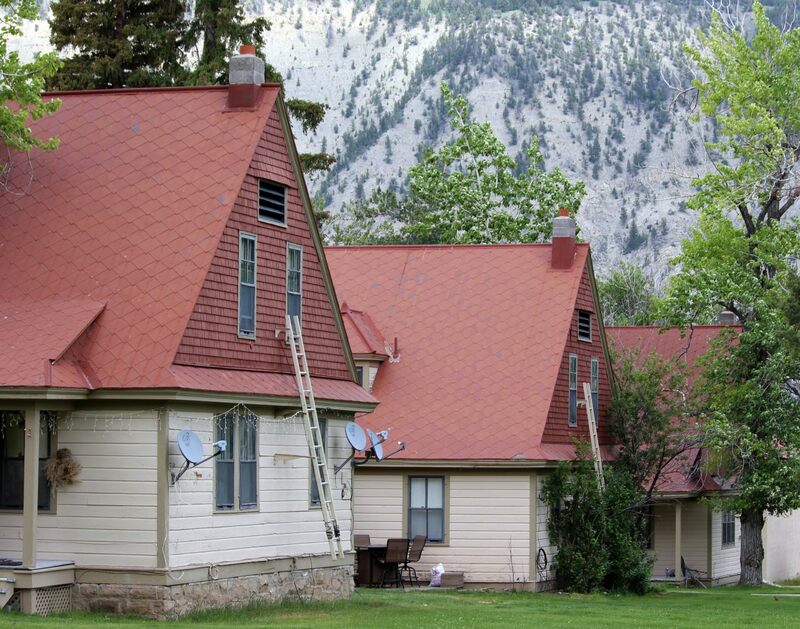 Dozens of red roof structures let visitors know they’ve reached the historic grounds of Fort Yellowstone. 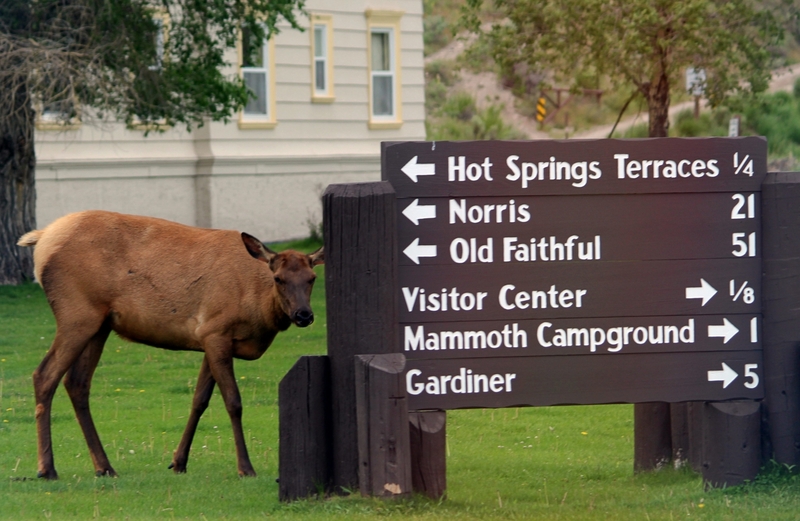 In addition to the historic structures, people enjoy checking out the elk that roam freely here. Despite their tame appearance, visitors should not approach the elk. We saw a park ranger alerting a man to the fact that his baby stroller was way too close to an elk. 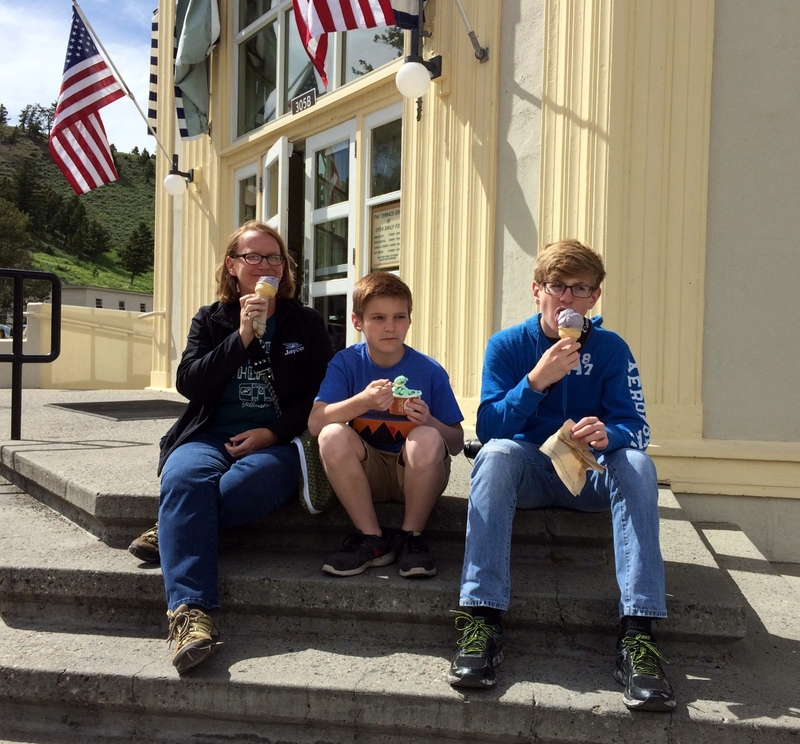 As we arrived in Mammoth, it was 3:00, which was our official ice cream time for Yellowstone. Since we took our lunch every day, we rewarded ourselves with a mid-afternoon treat. Sitting on the steps of the Mammoth Terrace Grill is a favorite memory. I opted for the huckleberry ice cream—a must have while in Yellowstone. 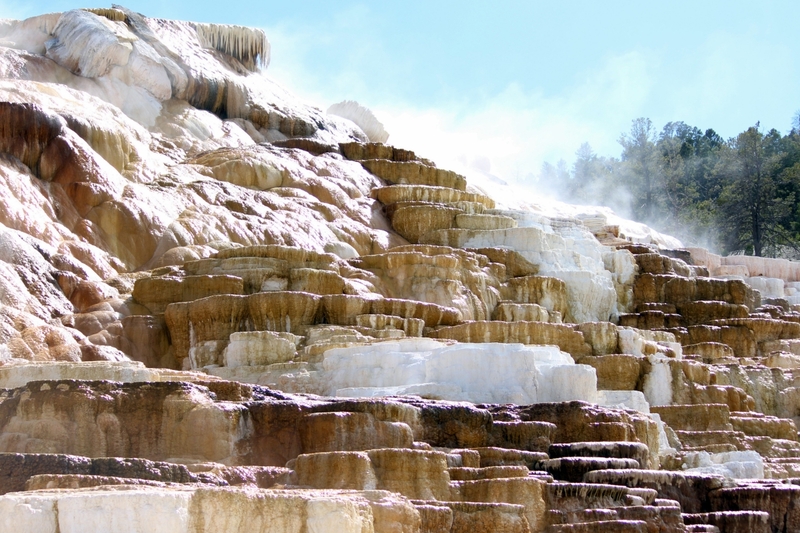 The main natural attraction here is the Hot Springs Terraces of Mammoth Hot Springs. Somehow, in all of my Yellowstone research, I had no preconceived expectations for what we would see here, and this area just blew me away. As we approached, we were greeted by Liberty Cap, a 37-foot tall cone made from centuries of mineral deposits from a hot spring eruption. Yet again, the completely freaky side of Yellowstone is on display with the mammoth structures found here. It’s odd how geometrical the terraces are in some spots, as if they were carefully designed. 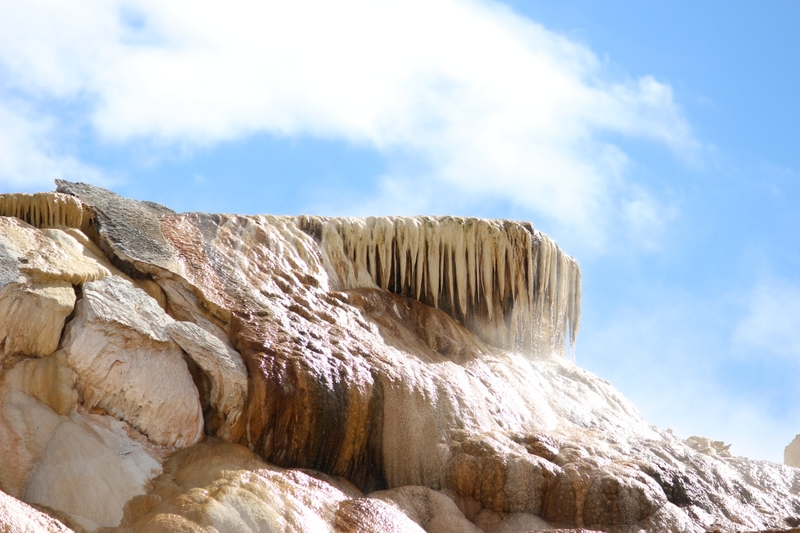 As the minerals emerge from the hot springs, the structure continually changes. This ever-evolving piece of art seemed otherworldly to me (apparently, the producers of Star Trek agreed—they filmed scenes here as the landscape for the planet Vulcan). 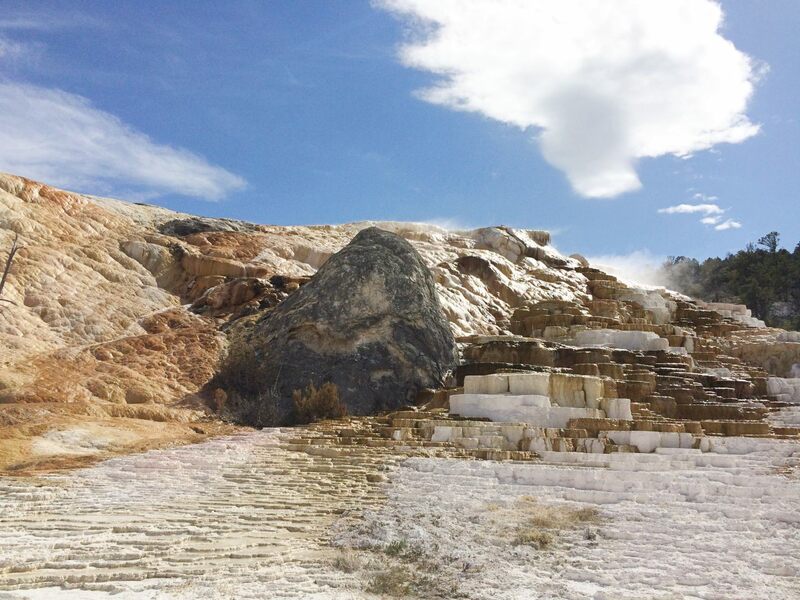 While in the Mammoth Hot Springs area, we should have explored some of the historic sites, including the Albright Visitor Center. 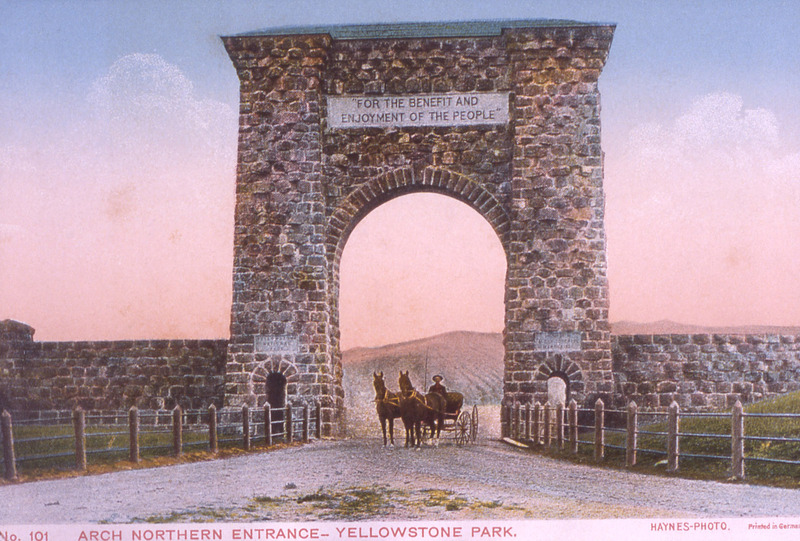 My biggest regret is that we didn’t realize we were just a few miles from the iconic Roosevelt Arch. For some reason, I thought this historic site was near the northeast gate of the park, but I later realized it was actually at the north gate. To see our other highlights, be sure to check out Part I and Part II of this series. Posted in: Places We've Explored. Tags: BirdyNPS100, Hiking, National parks, Wildlife, Wyoming. Wonderful series on Yellowstone! I am preparing for my third visit to the park and I am excited to find new things I have never seen before and to visit a few old favorites. I love your tips for scenic overlooks, just changing one’s perspective can change their experience. Great job! Thank you so much, Pamela. I’ve really enjoyed looking back on our memories. I think we are often so busy taking it all in that we don’t always fully experience it in the moment. Yellowstone is so huge, I’m sure people visit year after year and never run out of things to see. We barely scratched the surface. Have a wonderful visit!